As parents, we suffer from major video game, TV, and computer angst. We justify their computer time with the wistful possibility that our child is the next Steve Jobs. Did we let them play Halo too early? Did we really just shove the iPhone in his hand to play Jelly Defense, so we could have some peace and quiet on the drive to Grandaddy’s house? We spent some time with some iPhone, iPod Touch, and iPad apps appropriate for elementary age children to engage them in educational activities to help you feel a little less guilty. Hopefully, teachers might also be able to use this list to maximize the use of iPads in the classroom as well. Looking for more of a challenge? Be sure to also check out our list of recommended iPhone apps for Middle and Hight School Students reviewed earlier. The Whirly Word app for iPhone, iPod Touch, and iPad enhances and expands your child’s verbal capacity with this anagram game. My third and fourth grader sons love the challenge of finding words from six letters. You simply tap the letters to make words. Each set of six letters shows you how many combinations are available. If you get stuck and want to see the letters in a different combination, you click whirl and the letters reposition. The Whirly Word app incorporates problem solving by helping your child learn that new insights can be gained by looking at the same information from a different perspective. The app has three different color schemes, background music that may be muted, and a concise help menu. The Whirly Word app for iPhone, iPod Touch, and iPad also includes a setting to turn on tournament play vocabulary, and in turn, increases its appeal to more than just the under 10 crowd. The iStart Spanish! App for iPhone, iPod Touch, and iPad incorporates audio lessons, vocabulary, and quizzes to compliment your child’s Spanish curriculum. There are 50 lessons that are informative, intuitive, and fun. The audio lessons are written in text dialogue form, so your child sees and hears the words at the same time. Each lesson has interactive vocabulary flash cards with translation, audio pronunciation, part of speech, and word’s gender (if appropriate). As you progress through the lessons and find success, you unlock badges that can be shared on Facebook. The iStart Spanish! App for iPhone, iPod Touch, and iPad would be suitable for any age. It’s certainly helpful for the two parents who studied French, but have five boys studying Spanish. The Khan Academy app for iPhone, iPod Touch, and iPad is a tremendous tool for accessing informative videos for math and science. You search for courses by topics or via the search bar at the top of the catalog menu. For example, Arithmetic currently has 36 videos, and you can scroll through the topics listed from basic mathematical principles to fractions. You choose your course, and then click to download the video. The information is presented logically, clearly, and completely. The depth and breadth of topics covered in the videos is impressive, and it certainly covers math and science from elementary school through intro level college coursework. The Khan Academy app for iPhone, iPod Touch, and iPad is a great resource to compliment what your child is learning in the classroom. The Pocket Penguins app for iPhone and iPod Touch streams African penguins live from the California Academy of Sciences. There are three different cameras—one main camera, one underwater, and one with biologist audio. If the live stream is interrupted, a pre-recorded video of a biologist’s presentation can be viewed. Kids love penguins, and this app provides a great opportunity to discuss habitats, feeding habits, and scientific observation. Through the penguins, you can talk about other animals and environments. If you are local, then a code for $5 off admission to the California Academy of Sciences is available. You can also donate via text message from the home screen. Hopefully, those donations will come rolling in to fund the Pocket Penguins app for iPad. More teachers are using iPads in the classroom, and this app would be a tremendous resource for elementary science. Practicing math drills will no longer be a dreaded task with the Meteor Math app for iPhone, iPod Touch, and iPad. Your child crashes two meteors together to solve for the number at the top of the screen. There are three modes—practice, compete, and survival. In practice and compete modes, your child decides to work with addition, subtraction, multiplication, or division. The survival mode constantly changes between the four types of arithmetic. The speed of the meteors increases, as your child progresses through the levels. Teachers would also find the Meteor Math iPad app to be a great compliment to the work in the classroom. 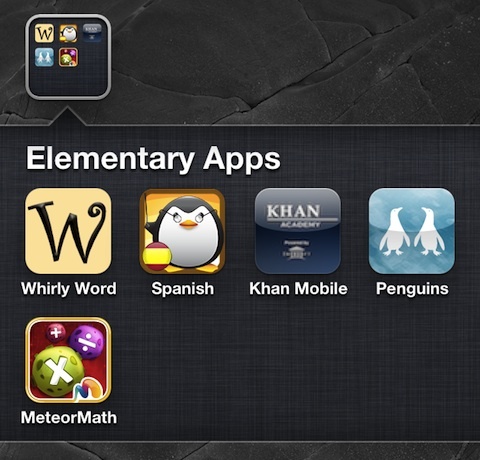 The Meteor Math app for iPhone, iPod Touch, and iPad is a must-have for parents of elementary age students. AppSafari review of Educational iPhone Apps for Elementary Age Kids was written by Jenni Ward on November 3rd, 2011 and categorized under App List, Education, Kids. Page viewed 4085 times, 1 so far today. Need help on using these apps? Please read the Help Page.